Tonight/early tomorrow morning sees the UFC embark on St Louis, MI for Fight Night 124: Stephens vs. Choi. Fight tipster Will Burns has done the math inside GetBetSmart’s ‘FightModel’ and picked out a few selections. Now one would think this would be a fight to avoid since both fighters are returning off a pair of huge layoffs, however I have a theory on why I’m siding with Kyung Ho Kang tonight. 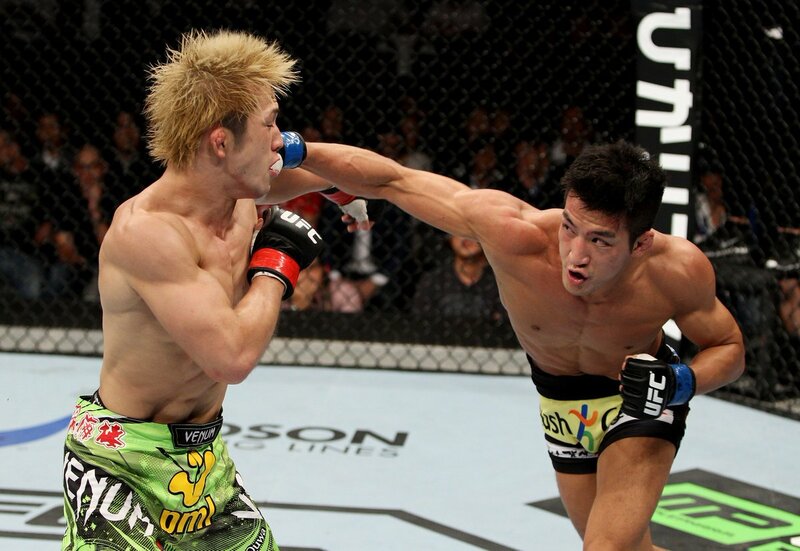 The 30-year-old South Korean, Kang (2-1 and 1 NC in the UFC) has not stepped in the Octagon since September 2014 due to national military service but before the absence he dished two wins over fellow Asian fighters Michinori Tanaka and Shunichi Shimizu. His opponent, Guido Cannetti (1-1 UFC) is eight years older than Kang and has not fought since August 2015 due to a USADA suspension for multiple banned substances, which he attributed to a tainted supplement. Before taking this unwanted leave, the Argentine did nail a nice decision win over the formidable Hugo Viana. When assessing the data for this fight, albeit the last information collected from 2015, Kang comes out as the better-rounded fighter and should have a vast advantage on the ground. He has excellent Brazilian Jiu-Jitsu. Recently, Team Alpha Male have taken Cannetti under their wing so we should see an improvement but his game-plan will be stand-up. The most likely outcome to his fight will be a Kang win (1.33 at SkyBet) via submission or a grinding decision and the South Korean is our first pick in the #UFCBanker. Brazil’s Kalindra Faria heads into tonight’s bout with Jessica Eye on the back of a disappointing tap-out defeat to late replacement Mara Romero Borella last October in her only UFC fight to date. Faria holds great experience with 25 fights under her belt and has the ability to finish fights in the stand-up or on the canvas. She is certainly no slouch, holding seven professional wins by form of knockout and another five via submission. Her opponent Eye comes into the Octagon tonight with a 1-5 record in the UFC after signing on the dotted line with the organisation with great promise. Although, if anyone watched her scraps against former title contender Bethe Correia in September 2016, and previously Alexis Davis in February 2014, you could debate that she should have easily had her hand raised. Three of Eye’s defeats were at the hands of Miesha Tate, Sara McMann and Julianna Pena, all powerful wrestlers that dwarfed Eye in size. However, tonight will see the 31-year-old Eye make her debut at 125lbs where I see her gaining victory over her Brazilian counterpart. She has not fought since the Correia fight due to both Aspen Ladd and Paige VanZant withdrawing from planned bouts but at this weight, she will prove to be more at home in the Octagon. In a fist-fight Faria is a dangerous but Eye’s boxing is vastly stronger and smarter she will get her hand raised tonight. An Eye win rounds out the #UFCBanker.